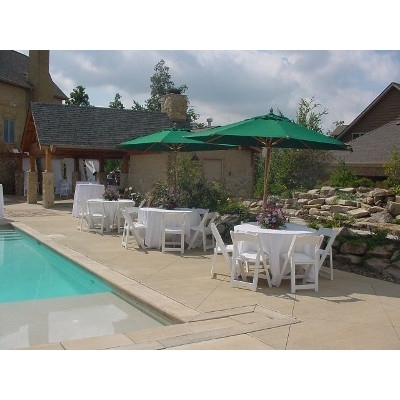 White linens and chairs look great against the sand colored-tiles and aqua pool. 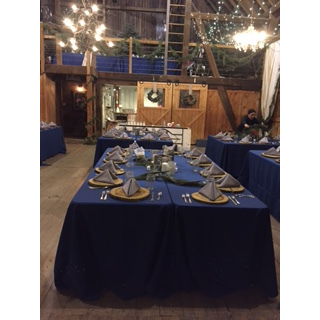 The 90x156 linen is an easy way to dress up an 8' table. 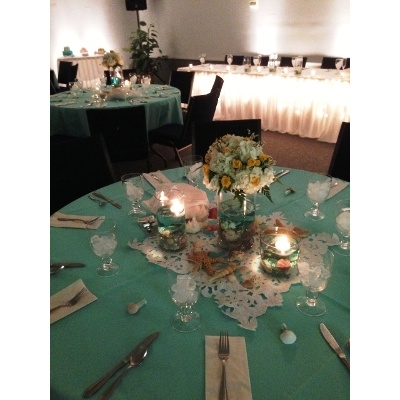 Turquoise linens make a pleasing look. Pink & white are perfect for a shower. 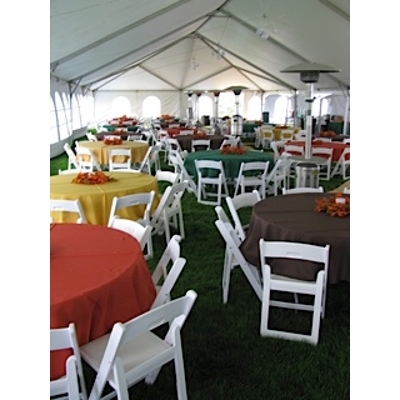 Festive colored linens can make your event come alive. 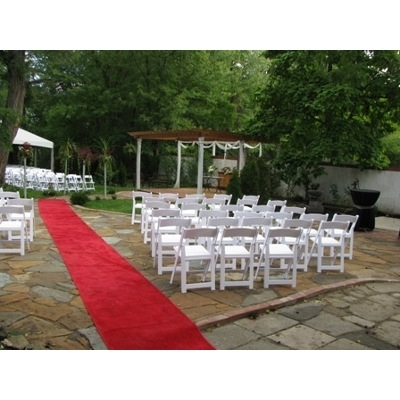 Roll out the red carpet and make your guests shine. 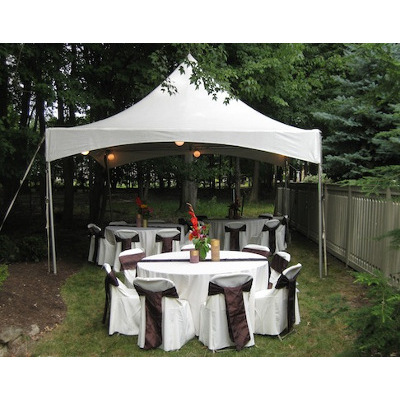 The 15'x15' Frame Tent works great in small areas. The 3-60” round tables are creatively placed inside & out. 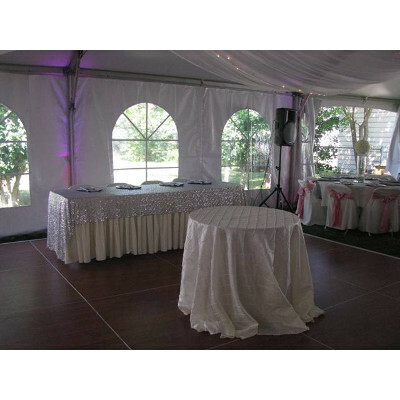 The tables are then transformed with 120” round linens as are the chairs with chair covers & sashes. 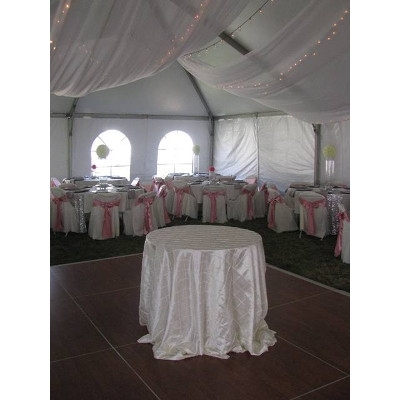 This setting elegantly displays our 30'x60' Frame Tent flanked on either side with a 20'x20' tent. 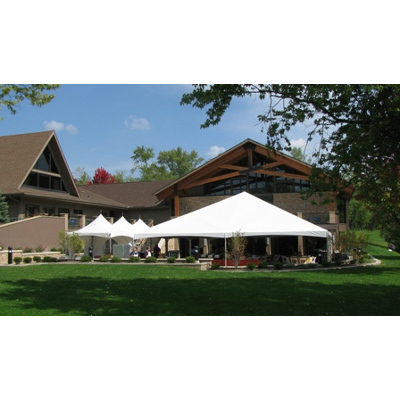 The 40' x60' Frame Tent is an ideal tent for large events. 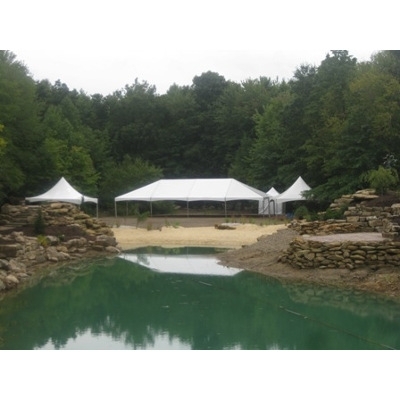 Here it is shown with 3-10'x10' tents. 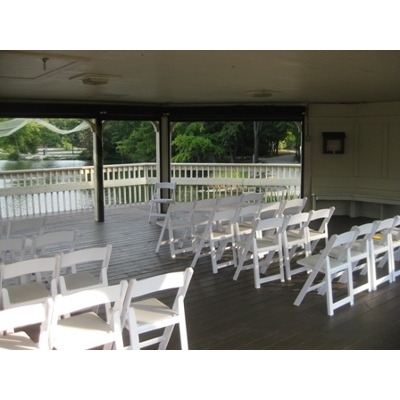 The Berea Gazebo makes a great wedding venue. 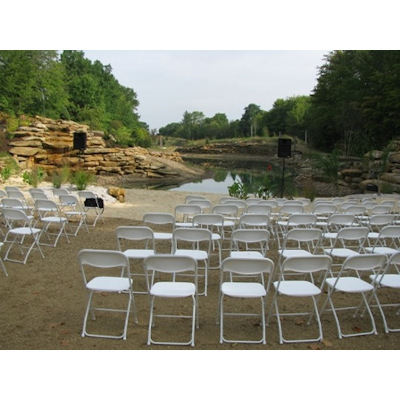 For this setup they used white padded chairs. 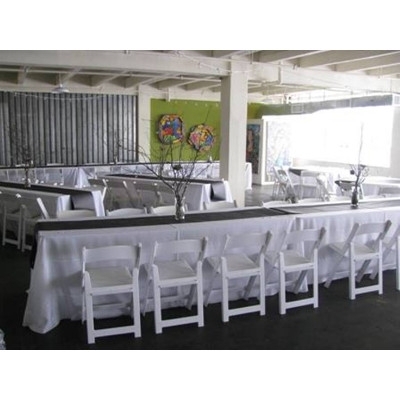 Using 8' tables covered with 90”x156” linens and white padded chairs make a classy look your guests will appreciate. 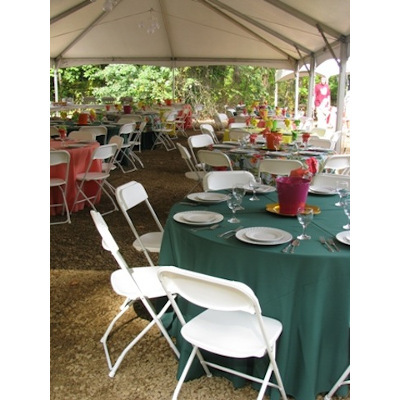 Your guests will enjoy the spaciousness and airiness inside a 40' wide tent. The high crisscross cables are perfect for hanging chandeliers. 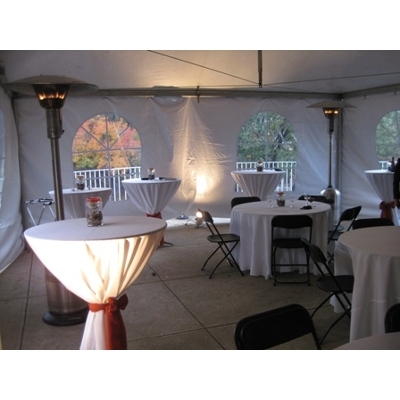 Cocktail tables, patio heaters, and 48” round tables add to the ambience of any event. 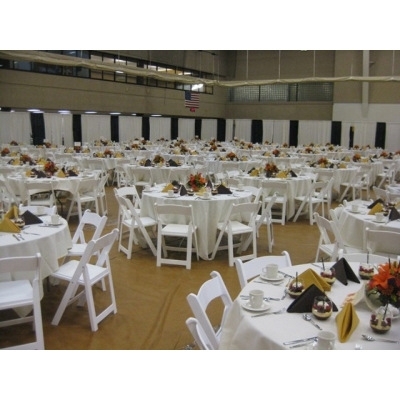 Transforming a plain gym into a formal dining hall is easy with backdrop, tables, linens & white padded chairs. 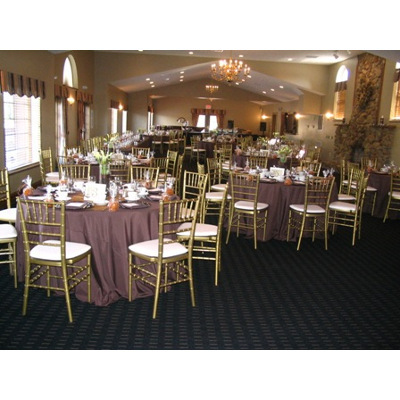 The gold chiavari chairs and floor length linens add elegance to your reception. 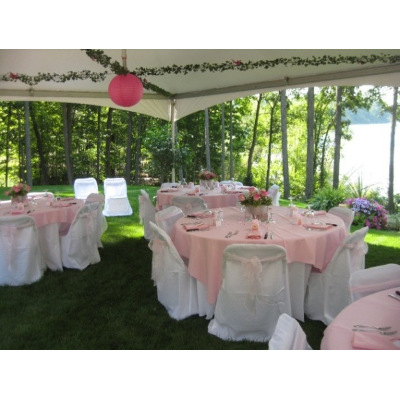 Outdoor wedding receptions can be simply gorgeous under a tent. 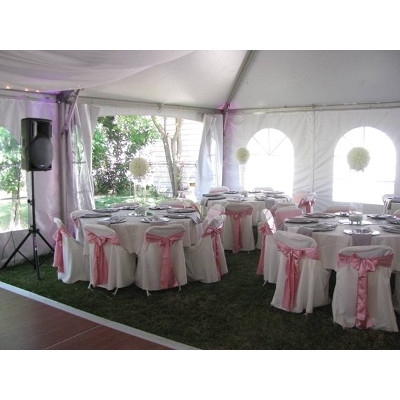 Chair covers and sashes make a nice addition. Dance the night away on our Cherry Rose Dance floor. 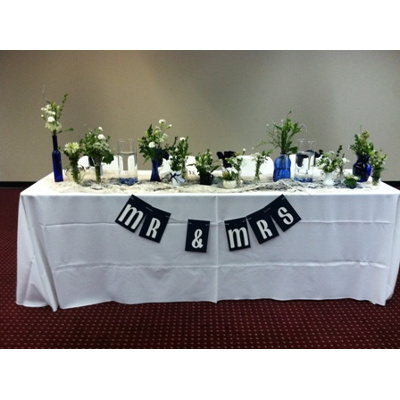 Don't forget the cake table, the 36” round table makes a great size. 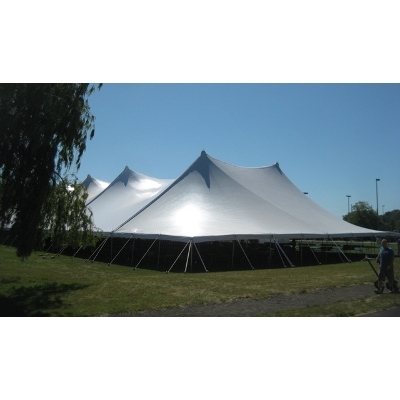 The 80'x200' Pole Tent has a commanding presence and is perfect for large events. Who says backdrop needs to be all one color? We offer several nice combinations. 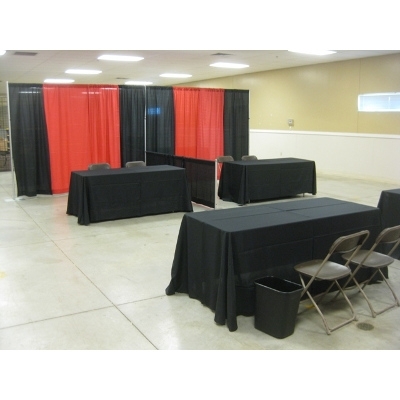 The look is made complete with a 6' table covered with a 90x132 linen, chairs and wastebasket. Roll out the red carpet! 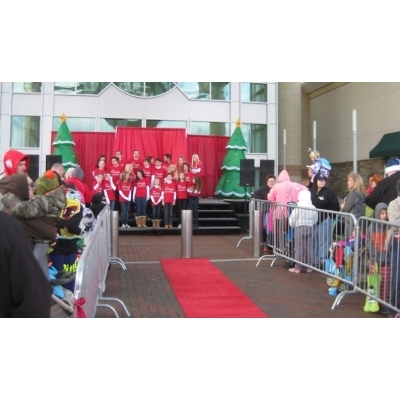 Crowd control barricades help keep your crowd under control for large events. Who says long tables are boring? 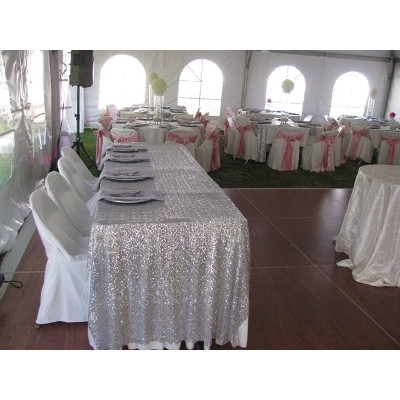 With the right linens, creative arranging and beautiful place settings, long tables can have a dramatic impact. 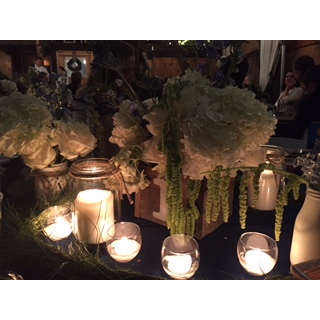 This gorgeous arrangement was sent in by one of our customers for her daughter's wedding. 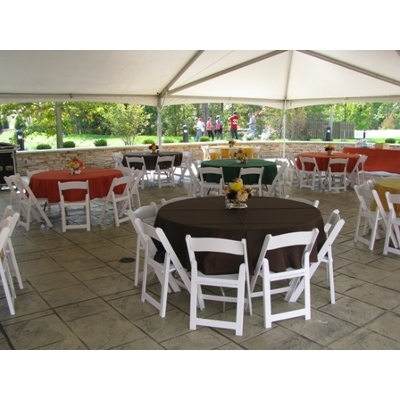 We offer linens in a wide variety of colors to give you multiple options. You can never go wrong with white, it's simple but elegant. 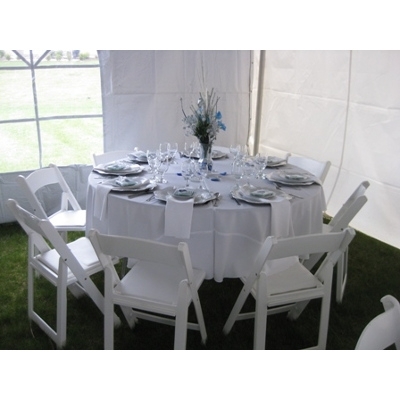 The white vinyl chairs make beautiful seating and are ideal for weddings.